Online media channels respond fast as number of last night plane crash victims now feared to be 100, according to latest reports. 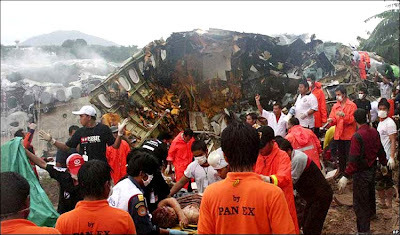 Thai budget airliner crashed while attempting to land in driving rain at the resort island of Phuket. According to Associated Press the plane was “splitting in two as it was engulfed in flames” while trying to land in heavy rain and then “skidded off the runaway and crashed into a wooded area”. There were 123 mostly foreign passengers and seven crew members on the plane McDonnell Douglas MD-82 of One-To-Go Airlines flight OG269 from Bangkok to Phuket. Eight British , eight Thais, five Germans and two Australians were among 42 known survivors, hospital workers said. According to Canada.com , however, there is also one Canadian survival. According to the Jerusalem Post, Eight Israelis feared among dead in the crash. Other victim nationalities seem to include citizens of at least Thailand, Australia, UK and Iran. Updates come every hours from online media channels who respond quickly but offer very little and mostly similar official information.Technorati indexed 459 posts by now for plane+crash+phuket with the last post from hotelsbycity.net just quoting the basic facts from the BBC UK item. Google blog search now offers 200 results for same query when narrowed down to “last 12 hours” with the last post from londoninfotech.net, posted just 23 minutes ago. Mostly interesting was The official BBC YouTube channel coming up quickly with a good video of the event as well as with this survival follow-up interview but disallowing embedding option “upon request”. Reuters, on the other hand, used their recently launched video embed system to offer the following video for further distribution. gearthhacks.com posted this kmz file for the exact coordinates of the airport area but it is obviously not an updated one and taken before the accident. When will the world have a public real time satellite service allowing all of us to be updated with a live video feed in the event of a mega-disaster? This entry was posted on September 17, 2007 at 3:57 am and filed under internet,news,publishing,review,video. You can follow any responses to this entry through the RSS feed. You can leave a response, or trackback from your own site.